On July 9, 2018, State Councilor and Foreign Minister Wang Yi held talks in Beijing with Minister Responsible for Foreign Affairs Youssef bin Alawi bin Abdullah of Oman who was in China for the 8th Ministerial Meeting of the China-Arab States Cooperation Forum. 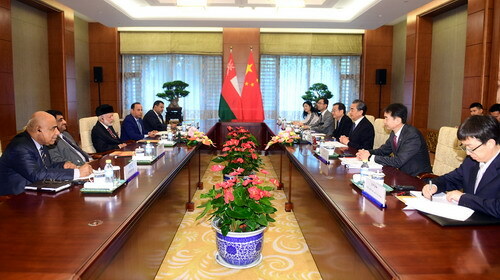 Wang Yi expressed that not long ago, President Xi Jinping and Sultan Qaboos bin Said exchanged congratulatory messages on the 40th anniversary of the establishment of bilateral diplomatic relations, and jointly announced the establishment of China-Oman strategic partnership, making the top-level design for the development of bilateral relations and promoting China-Oman relations to a new stage. Both sides should take this as an opportunity to maintain close communication and coordination, consolidate the foundation of strategic mutual trust, and earnestly implement the strategic partnership. The two countries should continue to support each other on issues concerning respective core interests and major concerns, accelerate the promotion of the joint construction of the Belt and Road and production capacity cooperation, and deepen bilateral financial cooperation of various forms. 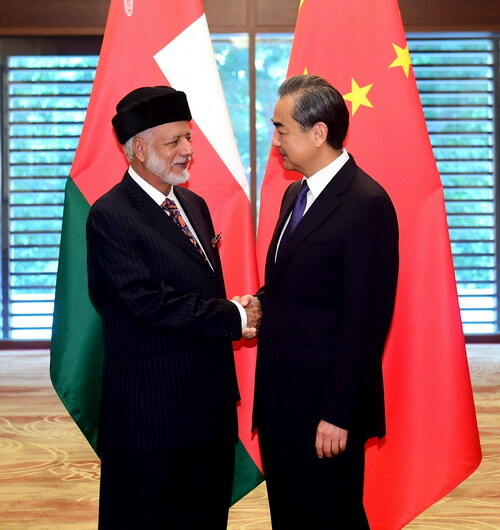 Youssef bin Alawi bin Abdullah expressed that attaching high importance to China's important constructive role in international and regional affairs, Oman has always viewed and developed its relations with China from a strategic height. Oman upholds the one-China principle, and supports China's stance on the South China Sea issue. Oman highly appreciates and actively supports the Belt and Road Initiative, and stands ready to strengthen cooperation in such fields as finance, investment and tourism with China under this framework, so as to promote bilateral cooperation for constant, new and practical outcomes. Both sides also exchanged views on regional issues of common concern.